Commentary: Day trading is popular again, and as controversial as ever. With the huge volatility in the stock market during the last year, day traders are back. Or maybe they never left. In the 1990s, day trading was all the rage, especially using risky strategies like scalping, where you’re in and out of hundreds of stocks in seconds or minutes, aiming to make small but quick profits. Scalping was profitable until decimalization, and the 2000 crash, when many once successful traders got wiped out. A few years later, people switched to day trading houses. That lasted until the 2008 housing crash, when many once successful homebuyers got wiped out. More recently, high frequency traders (HFT), the ultimate day traders, use high-speed computers to scalp for pennies in nanoseconds, which adds up to billions of dollars in profits every year. Although retail traders can’t compete with these million dollar computers, many lone day traders have returned to the stock market. Nevertheless, the controversy over day trading strategies hasn’t stopped. Last year, two successful traders, James Altucher and Timothy Sykes, had a blogging war over the benefits and risks of day trading. Dozens of comments from readers appeared on their blogs, attacking and defending. 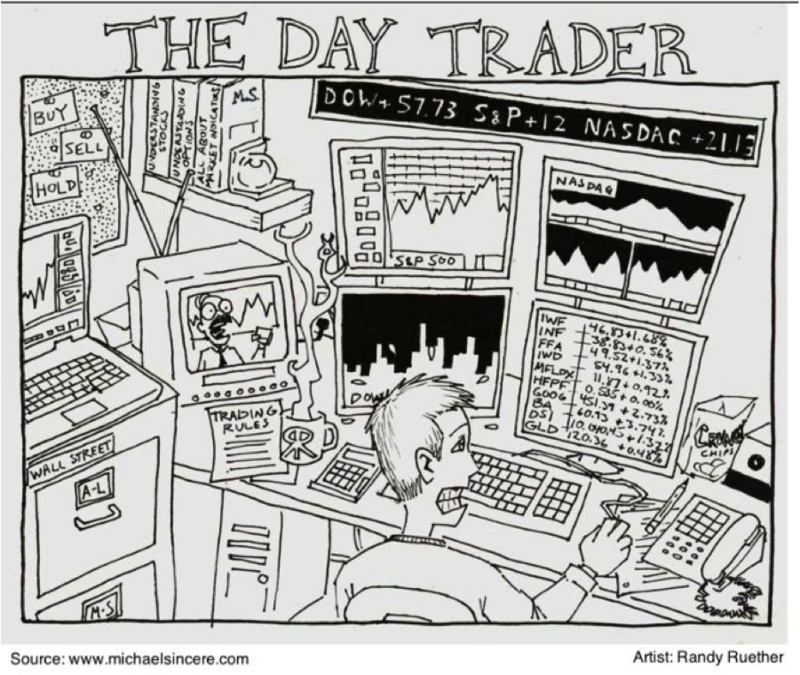 “Everyone wants to be a day trader. Let me tell you the best days. You get in at 9:25 a.m. You make the trade your system tells you to make at 9:30 a.m. And by 9:45 a.m., the trade is done, profitable, and you’re done for the day: $1,800 richer and happy about it…but it’s all a lie to yourself…” In the long run, Altucher says he has none of the qualities of a succ essful day trader. “And neither do you,” he concludes. He admits that day trading can be unhealthy, so he suggests hiring a personal trainer to lose weight. And yes, he says, your eyes can go bad, so get a glare protector for your computer. In addition, if your blood pressure is rising, it’s a clue to Sykes the trade is bad. He uses his body as an early biological warning system. The cure for most trading losses, Sykes suggests, is cutting losses quickly. Learning how to cut losses can also help you in life, real estate, and relationships. Another way to survive the day trading battlefield is to enter a trade with nothing less than a 3:1 risk reward ratio. It’s easier than ever to be a day trader because of technology, he claims, and you don’t have to be a genius. Ironically, he says he is terrible at math. Sykes says if you’re willing to aim for less profit, you can make a good living as a part-time day trader. Finally, Sykes suggests that if you’re part of the magical 10% that succeed at day trading, the freedom it provides is worth the effort. And even if you are socially incompetent, he claims, money makes up for it. Hopefully, people have learned from past mistakes — when unknowledgeable traders quit their jobs and cleared out their 401(k)’s to day trade. Many modern day traders trade less frequently and are choosier about the trades they make. Although day trading is not for everyone and is still controversial, it can be a viable strategy during certain market conditions. I’m now a featured financial columnist for Marketwatch.com, published by Dow Jones & Co., which is part of The Wall Street Digital Network, and includes WSJ.com and Barrons.com. To get a clearer idea of where the economy is headed, I spoke with Bernard Baumohl, chief global economist of The Economic Outlook Group and author of The Secrets of Economic Indicators (Pearson Prentice Hall, 2007). He’s had an excellent long-term record of making stock market forecasts. Because people are paying more for food and energy, Baumohl believes they are feeling financially squeezed. “Unfortunately, because workers don’t have the leverage these days to demand higher pay from their employers, there is a reduction in purchasing power, which has been reflected in the retail sales numbers.” Take out gasoline and food, he explains, and retail numbers are quite weak. Baumohl says the Fed’s argument is that the floods, drought, and turmoil in the Middle East are artificially lifting food prices, and that these transient factors will subside, and so will inflation pressures. At the beginning of the year, Baumohl was much more confident about the pace of growth of the U.S economy. And now, he is concerned that unexpected shocks are starting to have an effect on corporate earnings and the overall economy. He lists some of the reasons why the economy seems so lethargic: Cuts in spending by federal, state, and local governments, a weak housing sector, a soft jobs market, household wages that aren’t keeping pace with inflation, and the rise in interest rates around the world. For patient investors looking at a 10 to 15 year horizon, Baumohl suggests you invest in emerging countries like Brazil, India, Singapore, and China — even Mongolia. “Emerging countries may contribute 70 % to 80 % of the world economic growth for the next 10 to 20 years, so everyone should be exposed to that part of the world. We will also see a lot of U.S. companies taking advantage of the growth in these countries.” Even small and midsized firms will need to export overseas to increase earnings, he notes. Companies with exposure to emerging countries are especially attractive, he says, such as Rockwell Automation, Caterpillar, Procter and Gamble, Cummins, and 3M. “Other companies we like are CSX, Ford, and GM, who might do well relative to other stocks. It might surprise you but we also like the airline industry.